The unseasonably warm weather we've been having this week has summer on my brain. 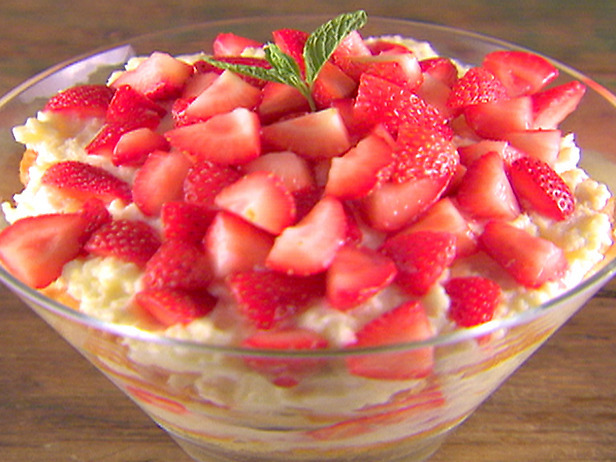 One of my favorite summertime recipes is this Lemon-Scented Mascarpone Trifle from Giada de Laurentiis. If you know me, you know I'm legit ob-sessed with the Food Network and have been since its creation in the early '90s. I've tried countless recipes from the Food Network folks but one of my favorite chefs to date has to be Giada. Her recipes are so simple and full of fresh, delicious ingredients. This one is no different and it's the perfect ending to any warm-weather meal. Macerate strawberries in a few teaspoons of granulated sugar. Let sit in the fridge. Cook lemon juice and sugar over medium heat until dissolved. Let cool completely. Stir lemon syrup into mascarpone and cool whip and mix until smooth. Brush Angel food cake with liqueur and layer with cream and strawberries. Repeat layers and top with final layer of cream and fresh strawberries. Garnish with fresh mint leaves if desired. Let trifle sit in the fridge for one hour before serving. Enjoy with your favorite summer cocktail! i am drooling! and that knuckle ring is soo fab!